In the harbor of New York City stands the Statue of Liberty, a symbol of freedom that has welcomed millions of immigrants for 112 years, half of the time that the United States of America has been a nation. And on the base of the statue is an inscription that says in part ".....Give me your tired, your poor, your huddled masses yearning to breathe free...."
I remembered that phrase when we were driving from Washington, D.C. to New York City and our van got caught up in the Sunday afternoon Manhattan traffic that led us past the Empire State Building on our way to Long Island. Freedom was very much on my mind as we headed for Stony Brook University to participate in the December 15 Vaccine Education Roundtable sponsored by New York state Assemblymen Marc Alessi (D-1st Assembly District) and Richard Gottfried (D-75th Assembly District), who is Chair of the House Health Committee. Americans have always cherished the freedom to breathe free; to speak, write and dissent without fear of retribution; to believe in God and worship freely without being persecuted; to vote for whom we want to represent us in government and know our vote counts; to follow our conscience and stand up for what is right. Although America is only 222 years old, which is very young compared to other countries that have existed for several thousands of years, during our short history there is no other nation that has defined and defended the freedom of citizens to live in a society based on the principle of equal rights and consent of the governed any better than the United States of America. These are troubled times for parents in New York and New Jersey and other states. Every day parents are facing more hostility from pediatricians throwing them out of doctor's offices for questioning vaccine safety and are being harassed by government officials determined to force their children to get dozens of doses of state mandated vaccines without voluntary, informed consent. New York currently mandates more than two dozen doses of 11 vaccines for school attendance while New Jersey leads the nation with nearly three dozen doses of 13 vaccines, including annual influenza shots. Religious exemptions are being pulled by state officials after they throw parents into rooms and grill them for hours about the sincerity of their religious beliefs. Last year in Maryland, state officials threatened several thousand parents with jail time and stiff fines for failing to show proof their children had gotten hepatitis B and chickenpox vaccinations. It is in this climate of fear and crisis of trust between parents, who want a more equal role in making vaccination decisions for their children, and pediatricians and public health officials, who are determined to strengthen their power to tell parents what to do, that Assemblymen Alessi assembled a panel representing both sides to discuss whether or not a philosophical exemption to vaccination should be added to New York's vaccine laws. Currently New York only provides for a medical and religious exemption, even as 18 other states allow a personal, philosophical or conscientious belief exemption to vaccination. After the Roundtable, Assemblyman Gottfried expressed strong support for First Amendment rights and told the audience of parents, doctors and legislative staff that he is sponsoring two bills to clarify rights defined under existing religious and medical exemptions so they cannot be violated by state officials. After the Roundtable concluded, he said "Important issues were raised. I look forward to seeing additional data from all sides, especially about the impact of the personal objection laws in other states. I will be reintroducing my bills to strengthen the religious and medical exemptions in the 2009 session. I urge parents to contact their local assembly members and state senators to urge them to co-sponsor." Assemblyman Alessi commented that "The discussion framed the fact that there is still a large debate on the issue. And although some people in the medical community are adamant that this debate is over, it has only just begun. The amount of conflicting evidence parents are presented with regarding the effects of certain vaccines is staggering. This forum opened the lines of communication between experts in the debate and provided concerned parents with the most recent information on the safety of vaccines. As a parent, I know how difficult it is to make the right decisions regarding our children's health, but if we are to make good decisions, we need to be well informed and continue to have discussions like this roundtable." At the beginning of the Roundtable, I framed the vaccine safety and informed consent debate and outlined how the informed consent principle relates to philosophical/conscientious belief exemption. I reviewed the general health ranking of New York (25th) compared to the 18 states which have philosophical exemptions (six of the top 10 ranked states have philosophical exemption) and noted that the U.S. uses more vaccines than any nation in the world but ranks 39th in infant mortality. Click here to read my entire presentation with live links to references (see text below). Other panelists supporting philosophical exemption to vaccination included New York pediatrician Lawrence Palevsky, M.D. , who called for an authentic dialogue that "moves past what appears to a growing number of citizens to be a one-sided, paternalistic, and patronizing set of policies and language with an unwillingness to engage in a real discussion about the science of vaccines." He challenged many of the myths and misconceptions about the safety and effectiveness of vaccine policies. Panelists defending current vaccine policies and opposing philosophical exemptions included New York pediatricians Paul Lee, M.D. , who agreed vaccine safety should be a high priority but disagreed that the amount of mercury and aluminum in vaccines posed a health risk; and longtime vaccine policymaker and American Academy of Pediatrics spokesperson Louis Z. Cooper, M.D. , who agreed trust between pediatricians and parents needs to be strengthened but defended the safety of existing vaccine policies; and Debra Blog, M.D. 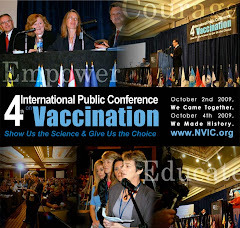 , medical director of the Immunization Program, New York State Department of Health, who showed slides of children with infectious diseases and strongly opposed adding philosophical exemption to New York state vaccine laws. Following panelist presentations there was a spirited debate that lasted for more than two hours as panelists argued and defended their positions. NVIC's videographer, Chris Fisher, will be making a video of the day's events available on NVIC's website. By the end of the day, I thought about how long parents of vaccine injured children have been asking pediatricians to become partners with them in preventing vaccine injuries and deaths. After nearly three decades, parents and doctors inside and outside of government could not be further apart. The failure of pediatricians and public health officials to take seriously the many cases of regression into poor health after vaccination has become the Number One public health problem in the U.S. today. There will be no resolution until every state has embraced the informed consent ethic and adopted conscientious or philosophical exemption to vaccination in state vaccine laws. At that point, Americans will be free to vote with their feet and the vaccines the public considers to be necessary, safe and effective will be used and those they do not consider to be necessary, safe and effective will be driven off the market. And then, a real time comparison of the long term health of highly vaccinated, less vaccinated and unvaccinated citizens will tell us a lot about the safety and effectiveness of vaccine policies in the last half of the 20th and first half of the 21st centuries. Thank you for holding this Vaccine Education Roundtable to discuss issues which impact on Assembly Bill 5468 to insert philosophical exemption in New York vaccine laws. I appreciate the invitation to be part of this panel on behalf of New York members of the National Vaccine Information Center, non-profit organization founded in 1982 to prevent vaccine injuries and deaths through public education and defend the informed consent ethic. Vaccination is a medical intervention performed on a healthy person which carries an inherent risk of injury or death. The risk of harm can be greater for some than others and there is no guarantee that vaccination will, in fact, confer immunity. With very few predictors having been identified by medical science to give advance warning that harm or failure to confer immunity will occur, vaccination is a medical procedure that could reasonably be termed as experimental each time it is performed on a healthy individual. Further, the FDA, CDC and vaccine makers openly state that often the numbers of human subjects used in pre-licensing studies are too small to detect all adverse events caused by a new vaccine. This makes government recommended use of newly licensed vaccines by millions of children a de facto uncontrolled national scientific experiment. In this regard, the ethical principle of informed consent to vaccination attains even greater significance. Informed consent means that a patient or guardian has the right to be fully informed about the benefits and risks of a medical procedure and be allowed to make an informed, voluntary decision about whether or not to take the risk. Informed consent is an important check and balance for the relationship between physicians and patients that encourages physicians to obey the Hippocratic oath to "first, do no harm." "The voluntary consent of the human subject is absolutely essential. This means that the person involved should have legal capacity to give consent; should be so situated as to be able to exercise free power of choice, without the intervention of any element of force, fraud, deceit, duress, overreaching or other ulterior form of constraint or coercion; and should have sufficient knowledge and comprehension of the elements of the subject matter involved as to enable him to make an understanding and enlightened decision." In America, the closest we come to upholding the informed consent principle with regard to vaccination is in the 18 states which allow personal, philosophical or conscientious belief exemption to vaccination. In the 2008 edition of America's Health Rankings, Vermont is ranked the number one healthiest state. Vermont allows philosophical exemption to vaccination. In fact, out of the top ten ranked healthiest states, six of them allow philosophical exemption (Vermont, Minnesota, Utah, Idaho, Maine, Washington). California is nearly identical to New York in ethnic diversity; numbers of children under age 18; median household income and persons living below poverty. California allows philosophical exemption to vaccination. What is interesting is that in the top 10 healthiest states, four had among the lowest vaccination rates for children ages 19 to 35 months: Utah (37th) , Idaho (45th), Maine (40th) and Washington (48th). California which is ahead of New York in overall health ranking, is 31st in vaccination coverage of 19 to 35 month olds while New York is number 9. The healthiest state, Vermont, is 29th in vaccination coverage. In fact, health is not primarily measured by high vaccination rates or an absence of infectious disease. High vaccination rates are not the most important measure of the overall health of citizens. The 18 states allowing philosophical exemption to vaccination have not compromised individual or public health when compared to other states. This past September, the CDC announced that national childhood vaccination rates are at near record levels, with at least 90 percent of young children receiving all but one CDC recommended vaccine. Less than 1 percent of children aged 19 to 35 months remain completely unvaccinated. Today, the U.S. government recommends the use of more vaccines than any other country in the world: 69 doses of 16 vaccines for girls; 66 doses of 15 vaccines for boys given between the day of birth and age 18. That is triple the numbers of vaccinations recommended by public health officials and physician organizations a quarter century ago, when 23 doses of seven vaccines (DPT, MMR, OPV) were routinely given. But in comparison to other nations, the overall health of Americans has not improved since 2004 and there are 27 countries that exceed the US in healthy life expectancy while the U.S. ranks 39th in infant mortality. Today, 1 in every 143 babies born in America dies; 1 child in 450 becomes diabetic; 1 in 150 develops autism;1 in 9 suffers with asthma; and 1 in every 6 child is learning disabled. The chronic disease and disability epidemic that has developed in the last quarter century is killing and injuring more children than any infectious disease epidemic in the history of our nation, including smallpox and polio. The social, economic, and human costs are enormous: nearly two billion dollars has been paid to vaccine victims by the federal government in the Vaccine Injury Compensation Program while three-quarters of the more than $2 trillion dollar annual price tag for health care is spent to care for the chronically ill and disabled. The big question vaccine educated parents are asking is: why are so many of the most highly vaccinated children in the world so sick, suffering with all kinds of chronic brain and immune system dysfunction? Why are babies born in the richest country in the world dying more often than babies born in poorer countries, who do not get vaccinated at all or who get far fewer vaccines? It is a question that has not been answered by any scientific study conducted to date because there has never been a large, prospective study comparing the long term health of highly vaccinated children to unvaccinated children. 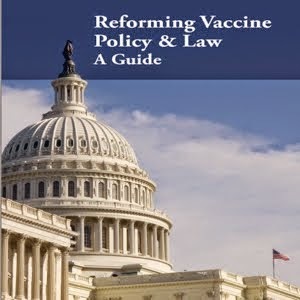 In the absence of definitive answers, the right to freely exercise medical, religious and philosophical exemption to vaccination is a human right that may well determine the biological integrity of this and future generations in America. Because vaccines are pharmaceutical products that carry significant risks greater for some than others; because doctors and public health officials are not infallible; because what is considered scientific truth today can be proven false tomorrow; because philosophical exemption to vaccination does not negatively impact on the health of individuals or states; and because informed consent to medical risk taking is a human right, the National Vaccine Information Center urges legislators to affirm the freedom of all New Yorkers to make informed, voluntary vaccination decisions for themselves and their children by supporting philosophical exemption to vaccination. At the same time that more Gardasil injuries and deaths are being reported every day, those promoting mass use of Gardasil are busy denying the significance of vaccine reactions while Merck is making plans to increase its market share by asking young boys to roll up their sleeves as well. The discussion in states about whether or not Gardasil should be mandated is still taking place even though all but two state legislatures (Virginia and D.C.) rejected mandates in 2007. It makes it easier for pro- forced vaccination proponents to keep proposed Gardasil mandates on the table when the CDC insists all of the health problems, hospitalizations, injuries and deaths that have been reported to the government's Vaccine Adverse Events Reporting System (VAERS) after Gardasil vaccination are just a "coincidence." Through the end of October 2008, the government has published a list of 9,762 Gardasil- related adverse events, including 30 deaths, that have been reported to VAERS. This number does not include the Gardasil vaccine-related health problems which have been reported to the VAERS but not yet published. It is estimated that only between one and 10 percent of all serious health problems following administration of pharmaceutical products are ever reported to the government. This gross underreporting of vaccine- related hospitalizations, injuries and deaths means that there potentially could be nearly one million health problems following Gardasil vaccination that have actually occurred since the vaccine was licensed in 2006. But who needs to count if it is all just a "coincidence?" It is good for business to downplay the significance of vaccine reactions and so researchers associated with Glaxo Smith Kline (GSK), who are perhaps looking toward the lucrative U.S. market for GSK's new HPV vaccine (Cervarix), are doing just that. Waiting for approval at the FDA, Cervarix contains a powerful adjuvant (ASO4) that has not been licensed for use in the U.S. That adjuvant is designed to send the immune system into overdrive. Will it also swell the numbers of VAERS Gardasil adverse events reports that can be conveniently written off as a coincidence by doctors, government and drug company officials? When perfectly healthy, bright teenage girls and young women get an HPV vaccination and collapse, have seizures, become paralyzed, are left with crippling fatigue and joint pain or suddenly die, their mothers and fathers deserve more than a "coincidence" explanation from doctors, government health officials and vaccine manufacturers. Until the public stands up to the Big Lie and calls it for what it is, those in charge of the U.S. vaccination system will continue to get away with putting policy and profits before good science every time a new vaccine is licensed and recommended for use by millions of Americans.